Five years ago this month, Janet Maslin-Bosher became the oldest mum of twins in Britain. Today, as her excited children get ready for their first day at school, Janet - just two months away from her 64th birthday - hopes their bright, smiling faces are proof that age is no barrier to motherhood. While most women her age are happy to put their feet up and enjoy retirement, Janet is thinking about packed lunches and sewing James and Sarah's name tags into their new school uniform. But she insists that, given her life over, she would do exactly the same thing again. "I love them and adore them and I feel very proud how they've turned out," she says with a big smile. "I suppose I also feel proud about what I've achieved. It's been hard at times, but something keeps you going. I think our bodies and our minds are made to push on and to survive. "A friend of mine looked after James and Sarah one afternoon and she said, 'They never stop. How do you manage? I couldn't do it.' But I told her she would manage, because you have no choice. Other women my age are winding down, but my life is on the up. "Some people have said I'm too old and that it was selfish to become a mum, but I'm fit and well and I do everything I can for them. I hope I'm as good a mum as any mum in her 20s, I try my best. I do feel tired, but then all mums do and I've spoken to lots of twins' mums who say they can't wait for full-time school! I really don't think about reaching 64. It was a milestone when I hit 40 and I don't feel any different to how I felt then. I think the children have kept me young." Janet has raised Sarah and James alone, after her partner Martin Maslin died of a heart attack when the children were just five months old. Martin, who was 64, was besotted with the babies and although they were too young to remember him, Janet says they still miss his presence. "They still ask for their Daddy," she says sadly. "They see daddies taking their children to school and they ask where their own daddy is. I explain he died and that he's in Heaven and looking down and that he loves them and they ask if he's coming back to them. They like watching The Railway Children because the children's daddy comes back. "One day I was in the kitchen and I heard Sarah say, 'I want my Daddy, to hug him', and James said, 'Don't be silly, you need wings to fly to Heaven'. "I miss him too and it's sad that he's not going to see them, especially on special occasions, such as their first day at school. But they are happy and content children and the fact that they don't remember Martin probably makes it less difficult for them, than for me." The twins, who turn five on September 20, are about to start at their primary school in Hounslow, West London. But rather than relish the relaxation that school hours provide, Janet has plenty of plans. She wants to learn to drive this autumn, decorate the house and volunteer to help at West Middlesex Hospital. Apart from a touch of arthritis in one hand and aching knees, there are few signs of Janet's true age. Many of her friends are mums 25 years younger than her. She tints her hair, is trim and fit and could pass for someone 15 years younger. "Sometimes when it happens I don't even bother to correct them, but other times I'll say, 'Actually, I'm their mother, but look at me, I look fabulous!' I make a joke of it and they always laugh and congratulate me. "As for other mums, age is not really an issue. We're all on the same wavelength, we discuss our children and we discuss the school. I respect them and they respect me. And my children aren't interested. They know I'm 63, but they don't connect that I'm older than their friends' parents yet." Janet became Britain's oldest mother of twins at the age of 58 in 2002 after receiving IVF treatment with frozen embryos. Her first husband had not wanted children and Janet had gone along with that. But after they divorced she met accountant Martin Maslin at a party. The couple fell in love but two years later, at the age of 47, Janet went through the menopause. She inquired about the possibility of IVF treatment when she was 51, but was turned down because she was on medication for chronic fatigue syndrome, or ME. Then, just as she was beginning to get back to health and daring to hope for another chance, Martin was diagnosed with lymphatic cancer. After he recovered, Janet went back to the London Fertility Centre at the age of 56. Although the centre's upper age limit is 55, Professor Ian Craft felt it would be cruel to turn them away as they had initially sought help when Janet was within the age limit. Another couple had donated two embryos after successfully completing their family following treatment at the clinic and Janet was chosen to receive them. The treatment was successful and the babies were born by caesarean section, four weeks early. Janet gets by on a state pension and often buys the children's clothes and toys from charity shops. There is little money left over to spend on her or the house, but she insists that the children do not suffer. I don't think you need a lot," she explains. "Children just need love and to be talked to. I sing to them a lot, read to them and play with them. "I've seen mothers in the park just sitting and not bothering with their children, but you've got to play with them and try to teach them to be good people. The other day James gave his seat up to an elderly lady on the bus, which was lovely. She was so pleased she gave him a pound for sweeties." The twins are biologically brother and sister. James is sensitive and enjoys drawing quietly, while Sarah is a bubbly chatterbox. Although she is fit and well, Janet admits that she does occasionally worry about their future. 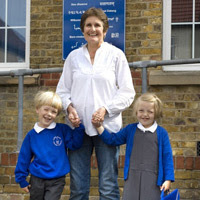 She will be 71 when they are 11 and starting secondary school, and she will be 77 by the time they are taking A-levels. She says: "Of course I worry and I'm in the process of talking to friends about guardianship so the children aren't left alone if anything happens to me, but I try just to take each day as it comes and make an extra effort to take care of myself. "I eat well and get plenty of rest and try to find some peaceful time on my own, which is important. My main hope for the future is to see them for their 21st birthday party." Having waited 59 years before experiencing motherhood, Janet was determined to be a full-time mum to James and Sarah. She says the many years she worked as a nursery and hospital nurse have helped. "Youth isn't everything and there are some advantages to being an older mum. I've possibly had a bit more experience of life than younger mums and I did all my partying in the 1960s," she laughs. "I've done all that, I worked hard and played hard - and now I just want to be with the children and give them my time. I'm quite happy to stay at home in the evenings - a younger mum might want more of a social life. "At night time when they play up I get a bit irritable and tired and I do think, 'Have I done the right thing?' But then I don't believe that any mum and dad doesn't have those thoughts. But then I look at them and think, 'I'm so lucky. I have beautiful, healthy children.' They are my life now." You certainly give blessed hope to us women in our fifties who would love to have a child. Many younger mother think is wrong. I feel a woman with more experience has the patience to deal with children more relaxed. I myself am 53 years old and look 35 years old. When I tell people my age they dont believe me and I have to show my drivers license. I am strong, healthly, I am planning on having a baby. Thank your for your inspiration.